Highlands senior Emily Pearce makes a back row attack. Pearce made 18 digs against Southside. Libero Kiara Pesina (2) watches. AREA TEAMS INCLUDED: Highlands, Jefferson. Jefferson was scrapping for every point and threatening to extend the District 28-5A match when Highlands senior Bryten Mitchan made her presence felt. Mitchan (10 kills) registered kills on three of four points, putting third-place Highlands (16-8, 6-2) at match point against Jefferson (6-13, 2-6). The Owls were able to polish off a 25-22, 25-13, 25-21 win Sept. 22 at the Alamo Convocation Center over the rapidly improving Mustangs. 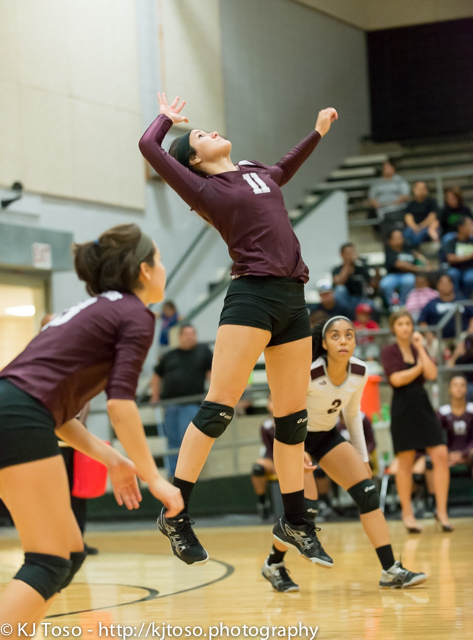 Highlands shared third with Harlandale (18-8, 6-2) after ending the week with a 25-11, 25-10, 25-18 decistion over Brackenridge (7-24, 1-7) Sept. 25 at the ACC. Harlandale also won two matches, including a 25-18, 13-25, 25-22, 18-25, 15-10 upset of co-district leader McCollum (18-9, 7-1). Edison (16-17, 7-1). After illnesses forced Jefferson to make lineup adjustments against Highlands, the additional match helped it settle into the new roles. The Golden Bears escaped with a 26-28, 25-20, 20-25, 25-22, 15-5 win at the ACC. Jefferson led Highlands 20-16 on an ace from Marisol Montejano (7 blocks) in Game 3 after senior Angela Hardcastle (7 kills) rallied the Mustangs. Mitchan’s first kill in the final run tied it 20-20. A block from Jenelle Rodriguez put the Owls in the lead and Mitchan delivered back-to-back kills ahead of another Rodriguez block.